Some time ago I wrote here that during a certain period of my qigong practice, there were 1-2 nights, in which the Chinese characters of some poems appeared in my mind while I was sleeping.These poems are related to qigong cultivation. The wandering visitor comes to leave knowledge. The Heaven and Earth bring pure essence. * the white jade ascends to the heavenly bridge - this is a symbolic description of one of the phenomena occurring during the qigong practice. A white cloud of pure qi ascends towards the head and reaches the fontanelle ( bai hui acupoint). The Nobleman (Tian Yi Gui Ren 天乙贵人) is an auspicious symbolic star in Four Pillars astrology. It neutralizes the negative influences and is supposed to bring good luck. Thanks to it, one can easily receive help from others – visible or invisible assistance. There are many speculations about this symbolic star. After learning that they have Nobleman in the horoscope, many people become highly elated, feeling that they are protected by some sort of angels and higher beings. And if you tell them that they have 2 or 3 Nobleman stars in the chart, they become very excited: “Wow, I have 3 guardian angels!”. This way of thinking easily leads to illusions and misunderstandings. The calculation of the Nobleman star is based on the heavenly stems combination. Normally the stems combination is regarded as a positive aspect in Chinese astrology and therefore this symbolic star is given a positive characteristics of assisting the person and removing the obstacles of his way. But there really is nothing that much special in the meaning. Jia (Yang Wood) + Zi (Rat) --> Jia (Yang Wood) combines with Ji (Yin Earth), therefore for Ji the Yang Nobleman is in Zi (Rat). Yi (Yin Wood) + Chou (Ox) --> Yi (Yin Wood) combines with Geng (Yang Metal), therefore for Geng (Yang Metal) the Yang Nobleman is in Chou (Ox). Bing (Yang Fire) + Yin (Tiger) --> Bing combines with Xin (Yin Metal), therefore for Xin (Yin Metal) the Yang Nobleman is in Yin (Tiger). Ding (Yin Fire) + Mao (Rabbit) --> Ding combines with Ren (Yang Water), therefore for Ren (Yang Water) the Yang Nobleman is in Mao (Rabbit)..."
For Yin Nobleman the calculation formula is Jia (Yang Wood) + Shen (Monkey). From this base we look counterclockwise. Jia (Yang Wood) + Shen (Monkey) --> Jia (Yang Wood) combines with Ji (Yin Earth), therefore for Ji the Yin Nobleman is in Shen (Monkey). Yi (Yin Wood) + Wei (Goat) --> Yi (Yin Wood) combines with Geng (Yang Metal), therefore for Geng (Yang Metal) the Yin Nobleman is in Wei (Goat). Bing (Yang Fire) + Wu (Horse) --> Bing combines with Xin (Yin Metal), therefore for Xin (Yin Metal) the Yin Nobleman is in Wu (Horse). December 22nd is the Winter Solstice in the Northern Hemisphere. The Sun is at 270 degree on the ecliptic. In the past times, the Winter Solstice in China was regarded as an official holiday and the New Year's day. The scholars and practitioners of metaphysics have done important divination namely during the day of the Winter Solstice. At the Winter Solstice the Yang energy starts to increase (and the days start to get larger), while the Yin energy gradually starts to decrease (and the nights are becoming smaller). Slowly and almost unnoticeably Yang in Nature and within the human body is awakening and increasing from inside towards outside. Lao Zi says "Returning is the movement of Dao". Fu hexagram means “Returning, Coming back" and it consists of 1 Yang and 5 Yin. The past month (Hai) 亥月was completely Yin – with 6 Yin lines, but now a new cycle is beginning, in which the first rays of the Yang energy start to appear. In Chinese this is called “the appearance of first Yang” 一阳出 (yi yang chu). 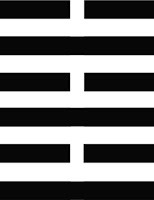 In ancient China the 10th month was named "kun month"坤月 representing the Kun hexagram 坤卦, which consists of 6 Yin lines. It was also called "Yin month" 阴月 and "Dark Winter" 玄冬. In comparison, the 11th month, in which happens the Winter Solstice, was named "the month of Returning"复月, "New Yang" 新阳 and "Return of Yang" 阳复. 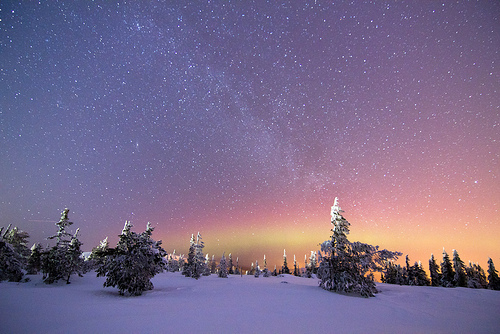 The several days before and after the Winter Solstice are characterized with very powerful energy in Nature. This is important time for more meditation and relaxation. Even in a non-meditation state one can feel that the energy and the blood circulation are very intensified as if in a deep state of meditation. Now the qigong meditation is very qualitative, it gets easier and faster to enter into the deep levels of subconsciousness. During the different 24 solar terms of Chinese calendar, qi is concentrated at different energy points (guan 关) on the small heavenly orbit 小周天. In the 15 days after the Winter Solstice the energy is concentrated at hui yin acupoint in the body as well as in the lower dan tian. Now qi starts to activate du mai (the Yang meridian) of the small heavenly orbit. At the same time, the energy flow is faster throughout the whole body. The days around the Winter Solstice are regarded as important time for qigong meditation, during which easily occurs "interaction between Water and Fire" 水火相交. Here "Water" is a symbolic representation of the kidneys in the body. 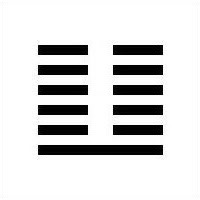 The 63rd hexagram ("After completion") in I Ching is also called "interaction between Water and Fire" 水火既濟. It describes a process that is very important in qigong. Here Water trigram (Kan 坎) is above Fire trigram (Li离). The Water flows downwards and the Fire goes upward, so when we have the conditions presented by this hexagram, the Water is above to nourish and balance the heart, and the Fire is below, so to warm up the Kidneys. In this way a good interaction is generated between the energies of the heart and the kidneys. The famous I Ching scholar Kong Yingda 孔穎達 from Tang Dynasty in China has commented that this hexagram gives a picture of cooking - "Drink and food are completed by it". This is related to internal alchemy - a natural process of generating and transforming qi during qigong meditation. 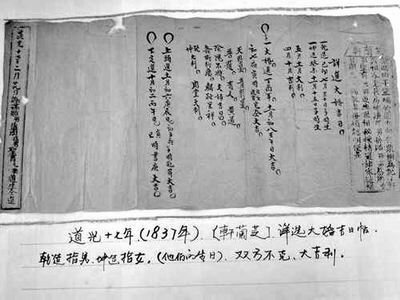 Wedding day selection letter written by a divination master more than 170 years ago in Kaifeng, China. In Qing Dynasty when the people wanted to get married it was common that they first go to ask a bazi master to choose an auspicious date for their wedding. After comparing the couple's dates and hours of birth, he assigned a date for the marriage. Here on the picture it is written that there is no clash between the two horoscopes, so the relationship will be very successful. Six years ago in Beijing I met two Taoist monks who are practicing Chinese astrology and metaphysics for many years. One of them was dressed completely in white, while the other - completely in black. Exactly like Yin and Yang. These Taoists are good friends and together they visit different parts of China. The Taoist that is in white is actually an albino. That's why even his hair is white. Otherwise he is not that old as it seems. It is very rare to see an albino Chinese. He was talking and expressing himself in a very Yang style, vividly and extrovertedly. In comparison with him, the Taoist who is dressed in black was a very Yin type and introvert. We had a nice conversation and exchanged some ideas about Chinese astrology and I Ching. Few years ago I bought a Chinese book on the interconnections between I Ching and Chinese medicine - 《易医时间诊疗》, written by Ren Deze 任得泽 and Ming Yi 明易. The book has some interesting ideas. 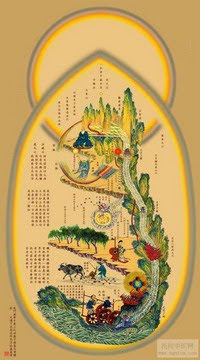 It shows examples of diagnosis with Yi Jing (I Ching); provides a detailed information on the 5 shu points of the meridians, zi wu liu zhu and lin gui ba fa chrono-acupuncture, Zhang Jiabin's theory of I Ching medicine, etc. The authors of the book have composed songs for each of the 64 hexagrams and you can learn these I Ching songs (there is also a CD with the songs). 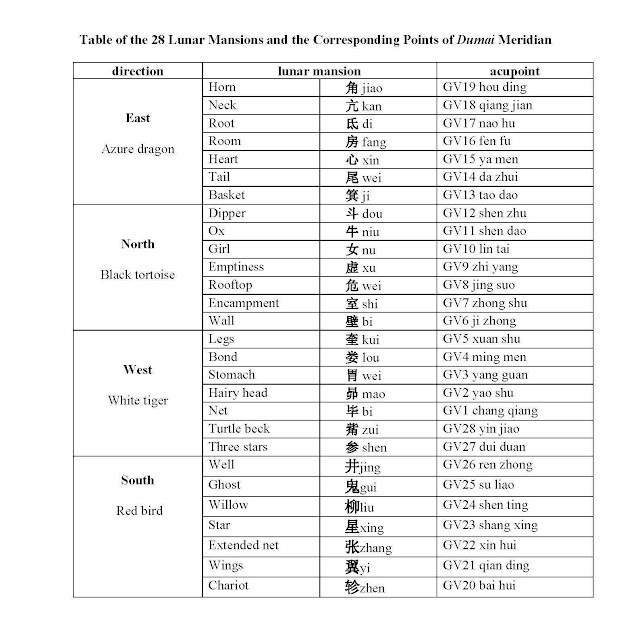 One of the most interesting parts of this book is the idea that there is a connection between the 28 lunar mansions and the 28 acupuncture points of Dumai meridian. 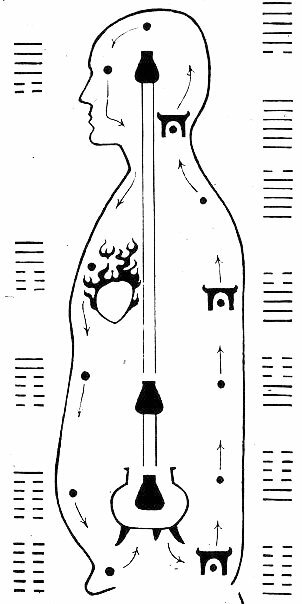 One lunar mansion corresponds to one point of the dumai meridian in the body. 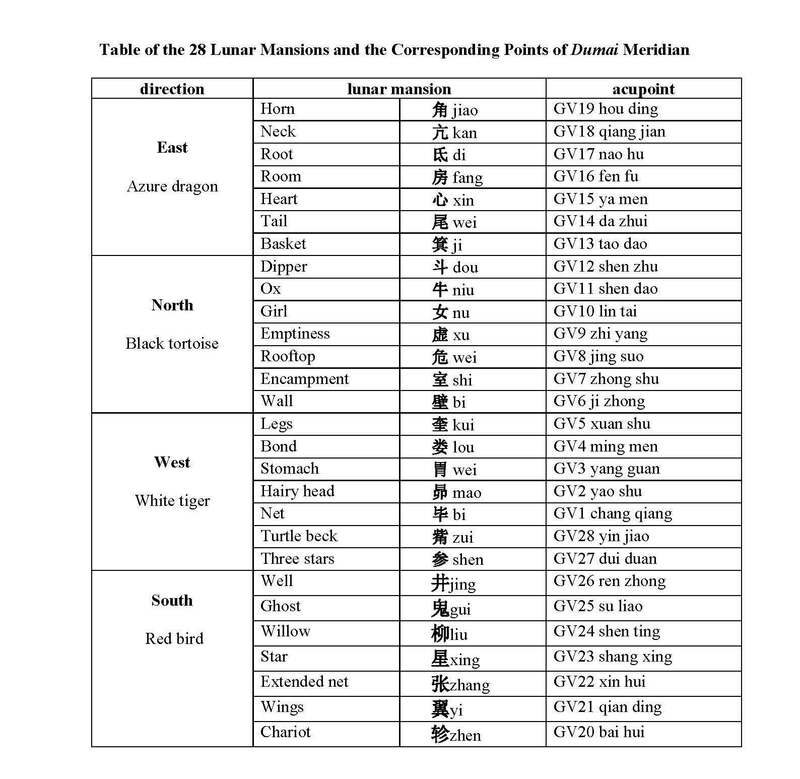 By checking which lunar mansion corresponds to one's date of birth, one can find which is the specific acupoint related to him. Then, one can press this point or apply acupuncture on it, in order to strengthen the qi and stimulate the healing process. After presenting this chart to my class of about 40~50 students, everyone started pressing the specific acupoints. They all have pointed out that the place where "their" acupoint is located is the only painful or sensibly more painful than the other acupoints of dumai meridian. It could be simply a psychological effect, but the sensations were a fact.